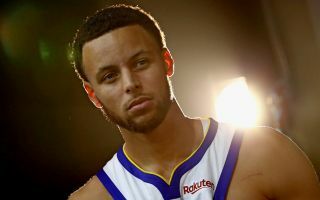 Two-time NBA MVP Stephen Curry poses for a picture during the Golden State Warriors’ media day on Sept. 24, 2018, in Oakland, California. During a podcast that aired on Dec. 10, Curry said he doesn’t believe that people have ever landed on the moon. NASA wants to show NBA superstar Steph Curry some rock-solid evidence that people have indeed been to the moon. On The Ringer's "Winging It" podcast yesterday (Dec. 10), Curry expressed doubt that the Apollo moon landings actually happened. Pretty much out of the blue, the point guard asked "Winging It" hosts Vince Carter and Kent Bazemore, as well as fellow guest Andre Iguodala — all of them also NBA players — "We ever been to the moon?" Several voices answered "No," and Curry responded, "They're gonna come get us — I don't think so, either." It's possible that Curry was joking. But, if he was being serious, NASA would like to help the two-time NBA MVP and three-time champion see the light, as The New York Times reported yesterday. "There's lots of evidence NASA landed 12 American astronauts on the moon from 1969-1972. We'd love for Mr. Curry to tour the lunar lab at our Johnson Space Center in Houston, perhaps the next time the Warriors are in town to play the Rockets," NASA spokesman Allard Beutel told Space.com via email. "We have hundreds of pounds of moon rocks stored there, and the Apollo mission control," Beutel added. "During his visit, he can see first-hand what we did 50 years ago, as well as what we’re doing now to go back to the moon in the coming years, but this time to stay." Former NASA astronaut Scott Kelly also reached out to Curry, saying via Twitter today (Dec. 11), "Steph, so much respect for you, but re the moon-landing thing, let's talk. DM me." The returned moon rocks are just the tip of the Apollo-evidence iceberg. For example, NASA's Lunar Reconnaissance Orbiter (LRO) has photographed multiple Apollo landing sites, showing pieces of hardware and moon-rover tracks on the lunar surface. And, if you think LRO is also part of the vast NASA conspiracy, consider how difficult it would be for everyone involved in the various missions to keep his or her mouth shut about this Earth-shaking news for five decades and counting. NASA officials also note that "all the Apollo missions were independently tracked by England and Russia (our allies and enemies), both of whom sent letters of congratulations after the moon landings. In the midst of a heated space race, the Russians would have called our bluff if the landings had not actually happened." If you want to learn more about "Apollo hoax" claims and why they don't hold up, check out this page, which astronomer Phil Plait together a while back. This isn't the first time a superstar NBA point guard has supported a space-related conspiracy theory: The Boston Celtics' Kyrie Irving said on a podcast last year that he believes the Earth is flat. However, Irving has since walked that statement back and apologized to science teachers for making it.